rotherham business news: News: Rotherham Mamas & Papas store "unviable"
News: Rotherham Mamas & Papas store "unviable"
Mamas & Papas stores in Rotherham and Sheffield are under threat of closure if the Huddersfield-based premium nursery retailer cannot agree rent reductions with its landlords. The company was born in 1981 by David and Luisa Scacchetti and has grown to over 60 stores in the UK and Ireland. A wider restructuring plan for the group was announced earlier this year following investment from Bluegem Capital Partners in July. 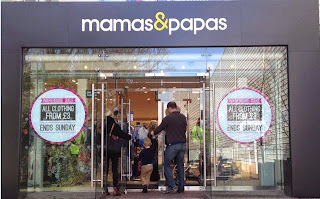 As part of the restructure, experts at Deloitte were appointed by Mamas & Papas (Retail) Limited to negotiate a Company Voluntary Arrangement (CVA) to revise lease terms for its stores. A CVA is often used by insolvent companies to negotiate new payment terms or periods with its creditors, in this case, the rent on retail property. However, the CVA must be agreed by all creditors (the landlords) for it to be put in place. If it isn't, then there is a distinct possibility that the retailer will enter into administration. Daniel Butters, partner at Deloitte, said: "The proposed CVA will allow the group to revise lease terms and proceed with its wider restructuring plan. The proposals put forward offer the best possible solution for Mamas & Papas (Retail) Limited and all of its stakeholders in comparison to the likely alternative outcomes. The creditors will vote on the proposals on 10 September 2014." Now, Retail Week has published details of the CVA showing that Mamas & Papas stores at Parkgate Shopping in Rotherham and Meadowhall in Sheffield are considered "currently unviable." The two local stores join 23 others where the retailer is asking for a 50% reduction in rent. The news follows on from fellow retailer of baby products, Kiddicare closing its loss making stores - including the 45,000 sq ft store at Parkgate Shopping in Rotherham. Creditors approved the CVA "which will enable the retailer to revise lease terms and proceed with its wider restructuring plan." The stores continue trading as normal.